I might have been repeating myself with the New Year’s resolution I made last month. But, I meant it this time. I resolved to pull all those books off the shelf that have several pages marked with colorful sticky flags and cook the things I’ve been meaning to try for ages. With a new kitchen ready to be put to work, it’s time to cook even more new and different things than ever. So, off to the bookshelves I went, and the first book I grabbed was The Slanted Door which currently has no fewer than nine sticky flags poking up from the tops of pages. Every time I look through this book I find more pages to mark. Last weekend, I decided to try the Vietnamese Chicken Salad. This book doesn’t ask too much of the reader as far as hunting down specific ingredients is concerned, but there is an occasional item called for that’s not so easy to find. In this recipe, that ingredient was rau ram leaves which are also called Vietnamese coriander. I used cilantro leaves instead. 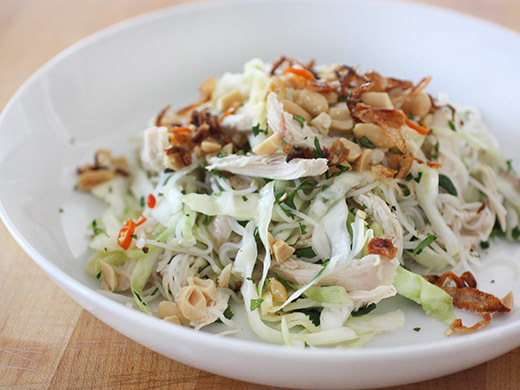 The salad was primarily poached chicken, fresh green cabbage, and rice noodles. With lots of pretty heads of cabbage to be found at the farmers’ markets right now, this was a great time to make this salad. In the book, a whole chicken is suggested for this recipe, but I used a couple of bone-in breasts instead. The chicken was salted, rinsed, and set aside while a pot of water was brought to a boil. The chicken, some sliced ginger, and four green onions were added to the boiling water and left to cook for 15 minutes. The heat was turned off, the pot was covered, and the chicken was left to sit in the hot water for another 15 minutes. Then, the chicken was removed from the water, allowed to cool, and the meat was pulled from the bones and shredded. Meanwhile, a half head of cabbage was sliced into thin ribbons. The cabbage ribbons were salted and left in a colander for a few minutes before being rinsed and drained. Rice noodles were cooked, drained, and set aside, and I tossed them with a little oil to prevent them from sticking together. The sauce for this salad was a flavored fish sauce made by adding white vinegar, water, minced garlic, and minced Thai chiles to plain fish sauce. Sugar was also to be added, but I’m preferring less sugar in food lately and used a smaller amount of agave syrup instead. 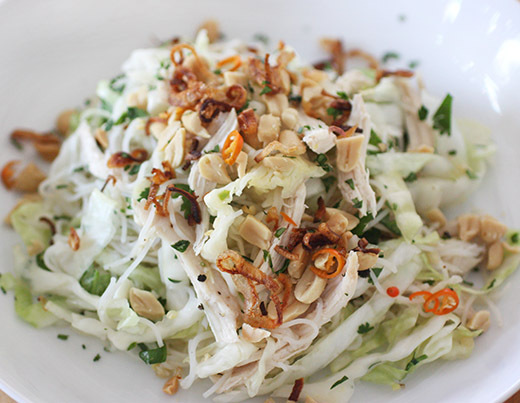 To complete the salad, the cabbage, cilantro leaves, and rice noodles were tossed with the flavored fish sauce. The chicken was added and tossed with the other ingredients. Each plate was garnished with fried shallots and chopped peanuts. I should have known better than to wing it with the number of chiles in this. I was sure I would want one more minced Thai chile in the sauce. Next time, I’ll stick to the recommended amount. So, yes, this was a spicy dish, and luckily I do like spicy. It’s also light and refreshing with the vinegar and cilantro. The flavors got even better after the salad had sat in the refrigerator for a bit. Now, I’m off to find more pages marked in other books and more new dishes to try. Fresh, crispy and delicious! My kind of salad. It looks delightful! I love the combo of flavour in this salad. What a wonderful salad! I'll be sure to look for that cookbook - sounds like it's got some terrific recipes. though i have little to no experience with vietnamese food, i think this sounds pretty tasty! i'm also now very curious about this vietnamese coriander! 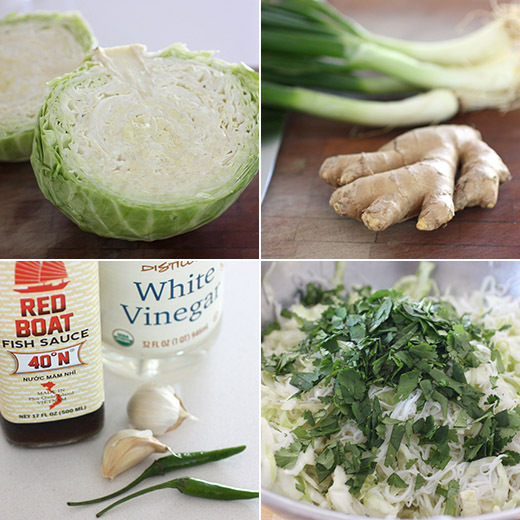 Sounds like a great way to use cabbage! Not to mention chicken. :-) Looks like a terrific dish -- thanks. I'll be cautious with the heat as spicy food and I don't play well together! It's a lovely salad, Lisa. Looking forward to your other sticky note recipes! Lisa this look really delicious! I love vietnamese meals ! !